Advanced Options include layout/master page settings and View script settings. Again, stuff that is also in the “Add New View” Dialog. Hello, today we will give brief explanation about how to Scaffold your ASP.NET MVC 3 project with the MvcScaffolding package. Before we move on, I have good information for all of you. We have supported the latest ASP.NET MVC 3. We are the one of the most providers that support ASP.NET MVC 3 in Europe. To preview this new product, please visit http://hostforlife.eu/ASPNET-MVC-3-European-Hosting.aspx. If you have further question about our new product, please contact us at here. 1. Install ASP.NET MVC 3, which includes the excellent NuGet Package Manager. 2. 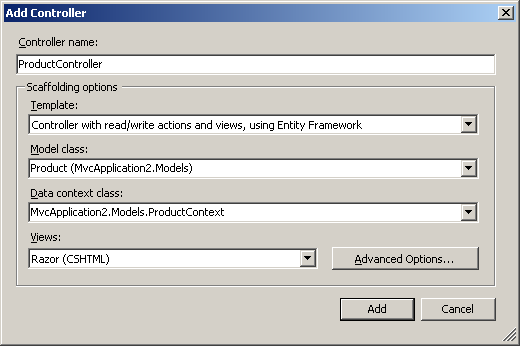 Create or open an ASP.NET MVC 3 web application. I’m calling mine ‘SoccerSite’. - Open the Package Manager Console window using Visual Studio’s View->Other Windows->Package Manager Console menu item. - That’s it! Note: be sure you installed MvcScaffolding, not MvcScaffold. We’ll retire the old MvcScaffold package shortly. 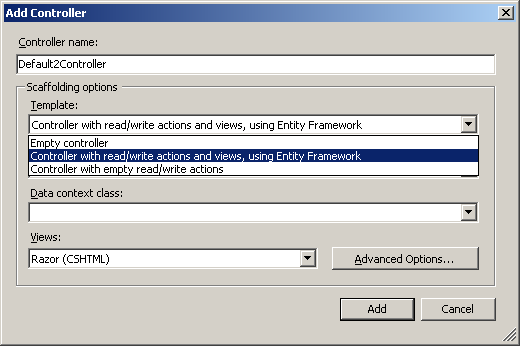 In case you’re wondering, EFCodeFirst is the new super-elegant version of Entity Framework that persists plain .NET objects to a relational database without any configuration fuss, T4Scaffolding is the core scaffolding infrastructure (locates types in your project, finds scaffolders in other packages, renders templates, etc), and MvcScaffolding is a set of ASP.NET MVC-specific templates (for controllers and views) that bolts onto the T4Scaffolding core. Note: You can use the TAB key to autocomplete many things in the Package Manager Console. In this case, you can autocomplete the words “Scaffold” and “Controller”, since the scaffolding package knows about them. It doesn’t know about “Team”, though – we may add completion on model type names in a future version. As you can see, it’s gone ahead and created a controller, a database context (a tiny bit of Entity Framework code that represents a data store), and views for all the CRUD actions. You can run it right now (Shift-F5), and as long as you have SQL Server Express running on your machine, EFCodeFirst will automatically connect to it, create your database schema, and you’ve got a basic working application without writing a single line of procedural code. The database is initially empty. Creating an item. 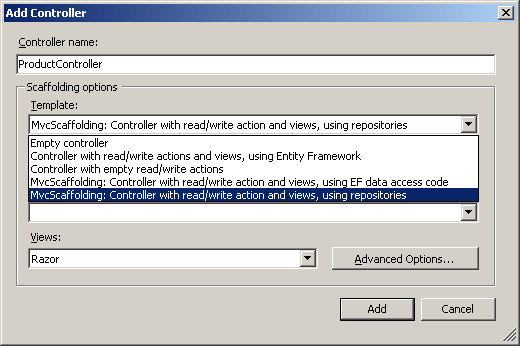 Validation rules are applied automatically. Note that since “Founded” is a DateTime it can’t be null and hence is required. Change it to DateTime? (i.e., with the question mark to make it nullable) if you want it to be optional. But what if I don’t have SQL Express installed? If you check out the code right now, you’ll see that TeamController reads and writes the data in SoccerSiteContext directly. That’s fine in many simple scenarios, but if you want to decouple your controller logic from persistence logic a little (e.g., so that you can write clean unit tests for the controller), you may prefer to reach your data through an interface. TeamController will now only read and write data using ITeamRepository. If you’re new to ASP.NET MVC it may not be obvious why this is desirable, but if you start trying to write unit tests or switch data access technologies, you’ll find this interface-based data access method to be much cleaner and more flexible. 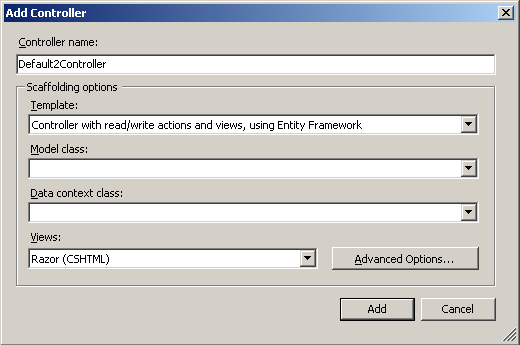 - Getting additional scaffolder packages and controlling which ones are used by default. For example, there’s currently a proof-of-concept LINQ to SQL scaffolding package that you can install and set to act as the default type of repository/data context. What is Common Service Locator?Today we have many Inversion of Control/Dependency Injection Containers like NInject,StructureMap,Unity,.. etc in the .NET world.Most of these vary quite widely in terms of configuration and initialization/registration of the instances.But they provide more or less similar interface while resolving the dependencies and returning object instances.Common Service Locator framework extracts these commonalities out and provides an abstraction on top of these IoC/DI containers.This is now part of the Enterprise Library 5.0 and used in the Enterprise Library code to create/retrieve objects.Common Service Locator provides an interface IServiceLocator. It is quite evident from the method signatures that these are only related to retrieval of right object instances with proper resolution of the dependencies based upon different parameters. Another important class related to the Common Service Locator is the ActivationException which needs to be thrown whenever there is exception in instantiating the objects /resolving the dependencies. We were planning to use StructureMap as the DI Container and a StructureMap Adapter for Service Locator was available in Codeplex but that seemed far from complete. So we have our Service Locator class ready. Today, we found a good answer on syntax highlighting for Razor. In the Visual Studio Gallery located at http://visualstudiogallery.msdn.microsoft.com/en-us/8dc77b9c-7c83-4392-9c46-fd15f3927a2e, a new Visual Studio extension has been recently added for a “Razor Syntax Highlighter”. To leverage this new extension, we had to remove the editor mapping for .cshtml files in the Visual Studio Text Editor/File Extensions window and install the highlighter extension. As you see in the figure below, it worked great. This new extension uses the Razor Parser libraries to appropriately highlight the Razor code. Unfortunately, this feature is offered as a Visual Studio Extension and hence is only available for paid-for Visual Studio 2010 editions. The Razor syntax has simply “inferred” that the code will have a closing curly bracket without us having to apply any special markup tags to it. This further reduces the markup needed to accomplish the same task. An important difference between Razor and ASPX View Engines is the absence of master pages for the earlier. Razor simply provides a _ViewStart.cshtml to bootstrap our application layout. Latest Razor Beta does however support Partial rendering (RenderPartial) to explicitly render a Partial View as well as calling @RenderBody() which loads the actual view content to be served. Now, HostForLife.eu has supported ASP.NET MVC 3 hosting. For more information about this new product, please visit here.